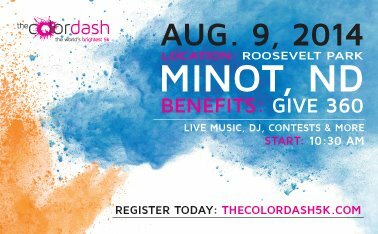 Give360 Color Dash - Word on the street with Visit Minot!Word on the street with Visit Minot! Give360 is bringing THE COLOR DASH 5k back to Minot with proceeds going toward the preliminary planning of a local children’s museum. At this family-friendly, non-competitive event, participants will run through a hurricane of color at each kilometer, creating memories and laughs too many to count! Registration includes a white Color Dash t-shirt and a color packet! We hope to see you all at Roosevelt Park on Saturday, August 9th! For more fun events happening in Minot, make sure to take a look at our clandar of events here.